* '''Participant panel''': For more details, continue reading about the [[Central participants database|central participants database here]]. * '''Participant panel''': For more details, continue reading about the [[Central Participant Database|central participant database here]]. To change the survey permissions, you have to select the '''Settings''' menu of your survey, which includes the general settings of your installation. Then, click on '''Survey permissions''' and choose to whom would you like to offer permissions. The rights can be offered either separately to specific users or to a user group. To change the survey permissions, you have to select the '''Settings''' sidebar of your survey. Then, click on '''Survey permissions''' and choose to whom would you like to offer permissions. The rights can be offered either separately to specific users or to a user group. 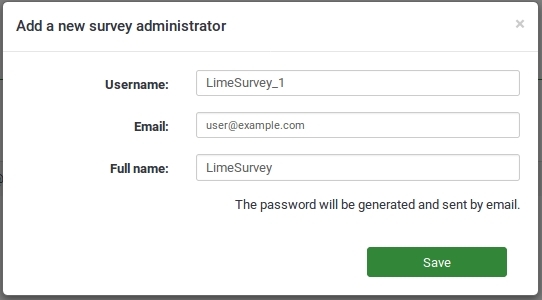 In the next step, select the user that will receive survey rights and click '''Add user'''. * Log in as ''admin'' (or as a user that has the ''Superadministratpr'' permission). * Log in as ''admin'' (or as a user that has the ''Superadministrator'' permission). * Create ''n'' user accounts (where n is the number of translators).